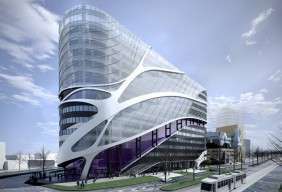 Based on the site of the former Royal Dental Hospital (corner Grattan Street, Flemington Road and Royal Parade) and linked by bridges across to new facilities at The Royal Melbourne Hospital, the VCCC Project will assist building partners to accelerate the discovery of new cancer treatments, attract the nation’s leading cancer researchers and provide a centre of excellence for people affected by cancer. Click here to view more on line about the VCCC. Binder Group was asked to provide a solution for custom trapeze and pipe supports to the contractor Downer EDI. With extensive design discussions with Downer EDI and the consultant it was decided that Binder Group’s Exclusive UltraStrut Channel was to be used for the trapeze supports, due to its light weight yet durable solution, achieved through the UltraSteel process provided by Hadley Industries. The application involved custom made size trapeze systems that were designed engineered and manufactured in house to support thousands of metres of cable trays. Through Binder Groups flexibility to provide A Solution and not just a product we were able to secure this project by providing, engineering design and expedition support on one of Melbourne’s highest profile and important projects. Our understanding of metal and structural products in the commercial building services arena is unrivalled and is on offer to all clients on the smallest or the largest of projects.